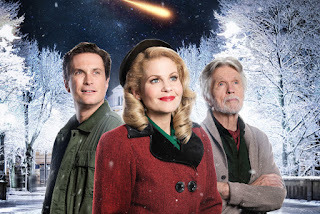 Have you seen the new Hallmark movie Journey Back to Christmas? Hallmark describes it this way: A WWII era nurse is transported in time to 2016 and meets a man who helps her discover the bonds of family and that the true meaning of Christmas is timeless. Hanna enters a shed to escape a winter storm after her car, a Hudson, ends up in a snowbank. That night the Christmas Comet passes over. The comet has a 71-year cycle. It is 1945, and Hanna winds up in 2016 to a bewildering world. The cars are all strange. People dress differently. The hospital where she worked is now a library. Her home is now the Organic Planet, where gluten-free toothpaste is sold; what’s gluten free? The family that takes her in has a hard time too. How do you explain computers? They try to outfit her with Uggs that she thinks are bedroom slippers. The townspeople are suspicious of the stranger in their midst. Hanna helped the town rediscover charms from their past: the gaily lit gazebo, caroling. The dog she rescued the night she disappeared led to a breeding program for service dogs. Imagine being transported 71 years into the future. Would you find that you had left a legacy? Do you think the world will be greatly changed and leave you wondering if you’ve lost your mind? If you haven’t seen Journey Back to Christmas and get the chance, don’t miss it. If you have seen it, what did you think?